Eformoterol is the generic name of the drug, which is the name of the active ingredient inside the medication that has an effect on your body. However, you may know it better by one of its brand names, which are the names given to the product containing eformoterol by the pharmaceutical company that produces it. There are two main brand names of eformotorol: Oxis Turbuhaler and Foradile. Oxis Turbhaler is available in two different does of 6 mcg/dose or 12 mcg/dose for inhaled administration, whereas Foradile is available as a capsule of for inhaled administration, containing a dose of 12 mcg. Eformoterol is also available in combination with budesonide, which another type of drug to help prevent asthma and COPD symptoms. This combination is useful because it means that a lower dose of eformoterol can be used, which is thought to be safer. The brand name of the eformoterol-budesonide combination medication is known as Symbicort Turbuhaler and is available in 3 doses for inhaled administration: 100 mcg/dose, 200 mcg/dose and 400 mcg/dose. Eformoterol is a type of drug known as a beta2 agonist. This is a group of drugs that act in a similar way to activate the beta2 adrenoceptors and cause the airways to relax. Specifically, it is a long-acting beta2 agonist because it works for a longer period of time in your body. Other long-acting beta2 agonists include indacaterol and salmeterol. Eformoterol works by stimulating certain receptors in the body, called beta2 adrenoceptors. When these adrenoceptors become activated, the smooth muscle surrounding the bronchial tubes relaxes, allowing the airways to expand and the air to pass through more easily. This is useful in the management of respiratory conditions such as asthma and COPD. Eformoterol has a longer duration of action than other types of beta2 agonists, which is what makes it a good choice for ongoing preventative treatment. It is also quick to have an effect, which means that it can also help to relieve acute symptoms. In combination with budesonide (e.g. Symbicort Turbuhaler,) it can act as both a reliever medication and a preventative medication, known as SMART therapy. 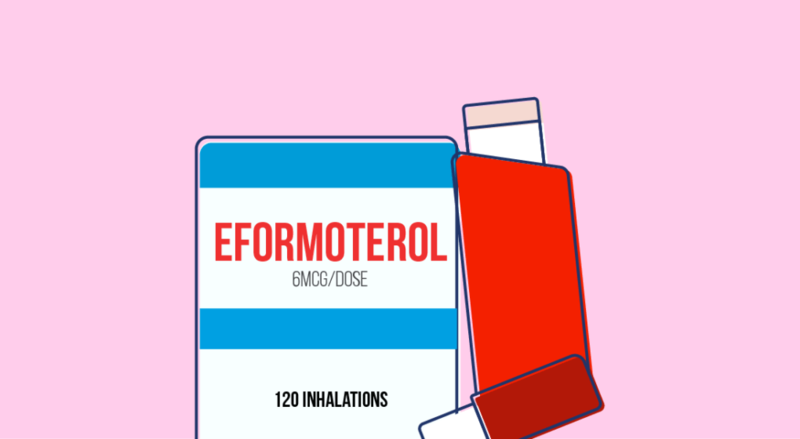 Eformoterol is usually used in the management of respiratory conditions such as asthma and COPD. It is quite quick to have an effect on your body and can begin working within 1-3 minutes of administration. The effect of the drug reaches a peak a couple of hours after being administered and can last for up to 12 hours. As it has an extended duration of action, it can be useful for the ongoing management of asthma and COPD symptoms to help prevent them from worsening. It can also sometimes be used for quick symptomatic relief because it is very fast to work its effect on the body. The Symbicort Turbuhaler that contains a combination of eformerol and budesonide can be used both for the prevention and treatment of symptoms. This is because it is able to provide timely relief of symptoms but can also provide longer protection from worsening of symptoms. This has the added benefit of increasing the preventative dose when the symptoms of asthma or COPD flare up and more symptomatic relief is needed. As eformoterol is a preventative medication, it is important to take it regularly as your doctor recommended, even if you feel better and don’t have any symptoms. This is because it may be helping to prevent asthma or COPD symptoms in the background and you may begin to experience symptoms again if you stop taking it. Most drugs that contain eformoterol are available as a turbuhaler, such as Oxis Turbuhaler and Symbicort Turbuhaler. Foradile is available as an oral tablet, but is also taken via the oral route. This is ideal because eformoterol is delivered straight to where it is needed so that it is able to work more quickly and you are less likely to experience side effects in other areas of your body. 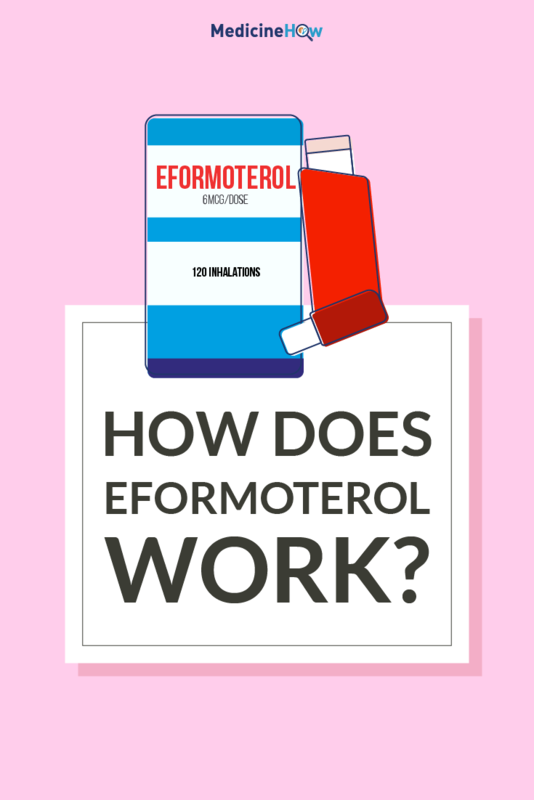 Eformoterol can interact with some other drugs that you may be taking, and it is important for you to be aware of these interactions so that you can double check that the combination is okay. When it is used alongside sympathomimetic amines (e.g. ephedrine, phenylephrine, pseudoephedrine,) there is an increased risk of side effects such as tremor, tachycardia and headache. This combination can be sometimes be used, but the doses may need to be changed to account for the interaction. B﻿eta-blockers are another group of drugs that are commonly used in the management of hypertension and arrhythmias. Beta-blockers and eformoterol have an opposite effect on the beta2 adrenoceptors in the body, so they are not usually used together, or a selective beta clocker should be recommended. When theophylline and eformoterol are taken together, there is a higher risk of low levels of potassium in the blood (hypokalemia). If you are taking both together, your doctor will need to monitor your potassium levels more closely than usual so that you can take action if needed. There are some people who may be more likely to experience side effects when taking eformoterol. Eformoterol is not usually used alone to prevent asthma or COPD symptoms. This is because there may be a risk of worsening symptoms when used in high doses. Instead, it is best to combine it with an inhaled corticosteroid medication so that they can both help to prevent symptoms and lower doses may be used. Elderly people often require lower doses than normal of eformoterol and are more likely to experience side effects if they take the usual dose. It is usually best for older people to begin taking a lower dose and gradually increase it if the symptoms of asthma or COPD are not well controlled. There is not much evidence to guarantee the safety of eformoterol for women who are pregnant or breastfeeding. However, it is important that asthma symptoms are well controlled and many women are recommended to continue taking it as usual before becoming pregnant. There is little data about the use of eformoterol for women who are breastfeeding, although it should be safe to use.